Are you a leg man? Well the question is, does your robot need legs at this point? You need to define what you want from your monster before you can answer this and to help you find some design answer I suggest you download the TRCY Robot Design Proposal Form. It'll help you organize your ideas. If you decide you are a leg man, then what sort of legs? A 6-leg hexapod? 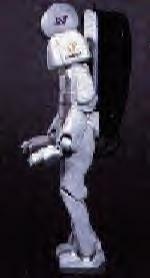 A 2-leg humanoid? Hybrid, legs with wheels to roll, then step up stairs...like R2D2? I don't know, I don't guess I'm a leg man because I don't need legs on my monster. I like wheels and when I out grow wheels I plan to use articulated tracks. Info on these options will come in the next section called Feet-Wheels. Another options is fake legs. Fake legs would be when you seperate your robot from it's wheeled base with something that looks like legs. I have made robots with fake legs and one design flaw I always forget is that the taller my robot it the more unstable it is with a small base. So if you use fake legs to make your monster taller remember that the taller they are, the harder they fall! But if I was going to make a walking robot I would base my design on the EyeBot - Walker built by Professor Thomas Bräunl of the Dept. of Electrical & Electronic Engineering at The University of Western Australia. This is a rough schematic as seen from his website of his robot and I don't think there could be a more adorable humanoid walking robot! It uses servos as many small walkers do. Now for a full scale walker I don't know what you could use, but who says you can't have a small monster troll? If you want to learn more about motors and gears then you have to check out out Motor Tech and read articles written by fellow member Gary Croll. shows, each leg has 5 degrees of freedom. I don't think Dave has named this robot yet. If you think Japan's Honda Humanoid ( pictured in the middle) was something then you have not see America's 13 year old Manny (pictured to the right). If you have seen the Honda robot you'll notice it looks like it walks like an old man. In other words bent over like he has a bad back, to me I think this is what helps the robot walk by keeping the center of gravity low. I could be wrong though. In contrast Manny is much older and looks very human like. You know this is a real winner of a project because Manny was built by the Pacific Northwest Laboratories in Richland, Washington. A government lab under the Department of Energy. Manny was started in 1986 and sent to US Army's Dugway Proving Ground in Utah in 1989. 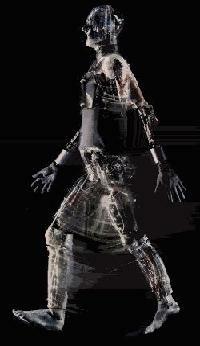 He also has 42 degrees of freedom and cost 2 million dollars with 12 researchers working on him. 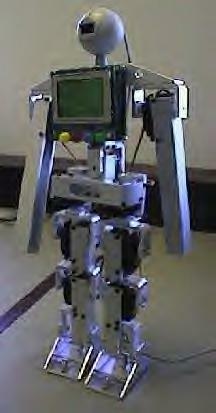 The US Army was kind enough to send me all sorts of great documentation on the Manny robot. It seems he could not walk on his own, but was able to crawl on the floor like a human. He was designed to test new military uniforms for protection against chemical and biological weapons. Manny had an respiratory system that could simulate breathing and sweat! I found out from PNL labs that Manny has since been retired for more advanced testing methods. And before anyone asks the Army would not give me the blue prints for Manny, I guess that can't give all their secrets away. 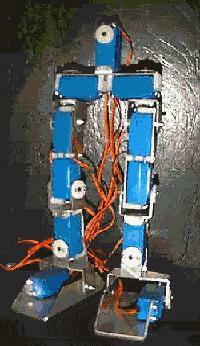 One more topic I want to bring up under the LEGS area is Modular Reconfigurable Robots. Modular Reconfigurable Robotics is an idea about how to build robots for various tasks. Instead of designing new robots for everything you think of, you just build one simple module and use it many times over to make a big robot. You could think of each module as a cell of the robot. The module are not much by themselves, but when you connect them together you get a system that can do complicated things. A modular robot can reconfigure itself or change its shape by moving its modules around. Which would lends it's self to climbing stairs or overcome most any terrain, or form giant hands to juggle people. If you do a search on the net you are bound to find many long winded theses on the theory of the construction of and use of such robots. But in the end you are probably not going to be very enchanted with what you find. Extensive list of walking robots and projects on the net, see the pictures then visit the sites to learn more. This is an ever evolving project and site and more content is sure to follow.